Life gets in the way and suddenly you are not where you thought you might be. That is the problem with expectations. You think and plan for one thing and another thing pops up. As did with my life this week. 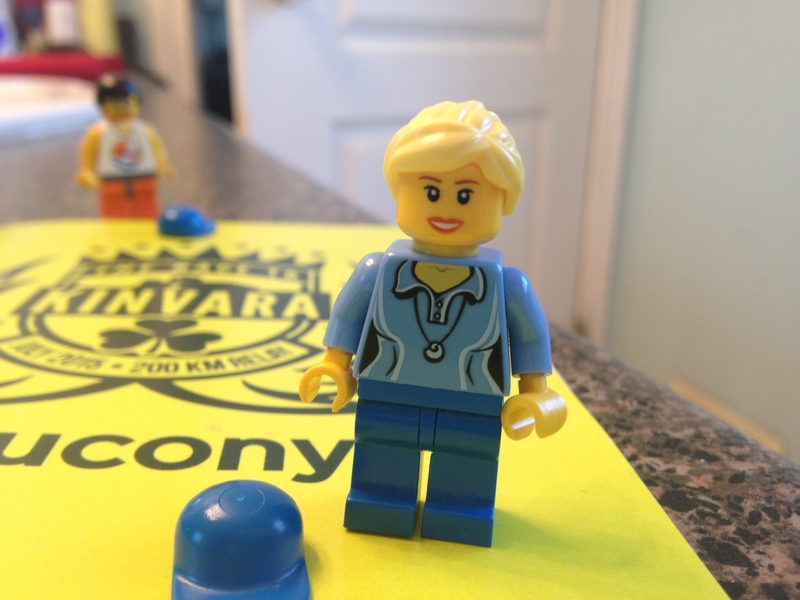 I went to my my post MRI follow up and discussed events. Things are progressing nicely – and by progressing I mean my Acoustic Neuroma is behaving itself. Swelling has changed and so my new normal plan is working out just fine. Stress free is my goal but seriously when has anyone ever lived through a stress free existence? I practice mindful meditation as a way to combat the anxiety I feel towards my AN and life in general. This has resulted in a positive change in outlook. For that I am thankful. My Mo goals have not been as successful but all things considered, I am pretty happy about that. Let’s recap; 2 weeks ago I set 3 goals for myself. Increase flexibility to be able to touch toes (again). Increase endurance by walking consistently. Strengthen core to improve posture. TOES! I became another inch close this week! I am 2 inches away from success. My body has begun to rebel and groans a bit but I insist we need to continue practicing. Walking! Well…. It is super icy and I just got cleats screwed to the bottom of my shoes. Falling is not helpful in my new normal life so safety first people! Perhaps this will help me achieve that goal. The winter weather feels like it is back so I missed warm and melty walking opportunities. Cool crisp evenings are something I look forward to. Core! WOOT! I see the most progress in this goal. I have increased to 100 crunches and feel pretty great about it. When I finish and I am lying on my floor, I can feel a waistline indent, take THAT wine from Friday night! Everything is tightening up nicely. 40 more as an increase felt really great. I am pleased to discover that it doesn’t take long to get back into fight shape. I obviously wasn’t starting from scratch. This pleases me. Goal 3=knocking it out of the park! For February I have been thinking about adding something to my morning routine. I think it will be small weights for my arms and shoulders, but I am still thinking about that. Getting back into fighting shape will be a slow process for me, but my goal of the Canada Road Race is still clear and in sight. I will make it. Having a goal where I am seeing major success has been motivating. Ultimately that is where I am at, finding the motivation to keep progressing. I stand before you with one week after the new Mo goals of 2017 were set. So Robyn, how did you do? Great! kinda…. sorta… but I am pretty happy about it. Let’s recap, last week I set 3 goals for myself. My first goal to touch toes went pretty well. I was 6″ away from my toes on Monday. By Friday I was 3″ away. This impressed me. I thought progress wouldn’t be as quick and when I was doing some yoga poses with my legs outstretched, I was able to reach my toes one leg at a time by Friday. In a standing position it hasn’t happened yet. But so far I am pleased. I spend about 5 minutes every morning doing this. The plan was for me to walk 30 minutes ever day after work with my dog and an hour on the weekend for a long walk. This did not happen. I have an excuse although its lame, It was -30 all week. Whatever, I’ll catch up. But I did go for a super long walk at Elk Island National Park! I saw a Bison and a wolf track. I trudged in a foot of snow. Next time I am renting snowshoes. If you want to hear about that adventure, visit here. Strengthen my core. That was hard but I did it. The worst of it is getting off the floor but that too with add strength. I started with 20 crunches and 10 crunches on each side for a total of 40. By Friday I was easily doing 30, 15 and 15 for a total of 60. That takes me about 5 minutes in the morning as well. But then I am done and it quickly has become a habit. I forgot on Monday, but remembered Monday night. Then I jumped right in on Tuesday morning and boom – easy peasy. My plan is to walk 30 minutes tomorrow, although my legs are pretty cranky today because the snow was deep. It was a large effort at Elk Island today. I also visit my Neurologist tomorrow and get my results from my last MRI. This is an event that I find very stressful. I am sure I will get good news but having an Acoustic Neuroma is stressful for me. People tell me to just stop worrying about it. ITs not that I worry, I am concerned. That is a big difference. I make sure I do all the right things because living a full life is important to me. Its not like you can just forget about it. I have symptoms that remind me everyday. I usually leave his office and cry for a bit in my car. The big stress relief. I do this even if its good news. I cannot help it so I just let it happen. No point fighting. Then I am able to move past it and focus on the goals and tasks at hand. It has been 18 months since I have posted here. Let’s catch up. 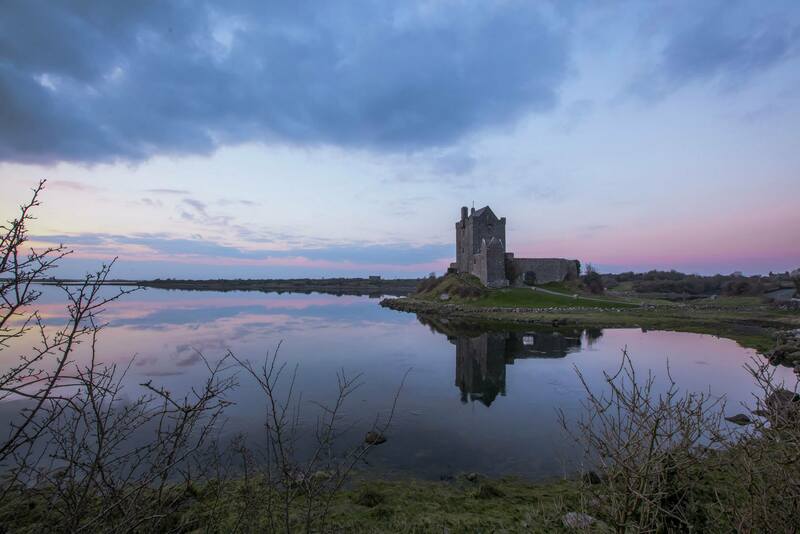 You last saw me in Ireland running across the country from Dublin to Kinvara. That was Epic. Then I helped my friend run from San Fransisco to Los Angeles for fun and we raised $10000 for Do Away with SMA. I race the Wine and Dine that year and then in 2016 I went to the Star Wars Rebel something something in Disneyland. That is when the wheels fell off. I tried running as this progressed but certain symptoms were more than I could handle. I took all of 2016 off and worked on figuring out what my new normal was going be. Let me tell you, it broke my heart because my physical progress from Fat to Less Fat was pretty damn important to me. I had an aunt say to me, ‘you better watch it – you’ll be fat again in no time.” I know people mean well but sometimes I think ‘Do they really?’ I haven’t really spoken with her now since….2015? I think? I cut out negative and mean people from my life. I made the choice to simplify everything. I found a pretty good balance but felt myself getting squishy… I still wear the same size but when you don’t use your muscles like you used to your shape changes. I am not likening that much. I gave up pop and artificial sugars. I gave up sugars for the most part, Christmas 2016 I went over board but, I can curtail that again easily. My eating habits are still pretty great but my exercise is not. Going for a walk once a week with my dog is good, but I need more. So I signed up for a Race. 2017 is Canada’s 150th birthday, My 50th birthday and Edmonton Marathon’s 25th birthday. While my dream of NYC Marathon is now a faded memory, I can still walk. Sure I have to walk slow and less far but I am still upright and not dead yet so all is well. I signed up for the Canada Day Road Race 2.5km. IT’s shocking to me that I am okay with 2.5k and not the 15 km or relay of even 5km. It has taken me a year to get over the fact that I do not run anymore. People say, well you will bounce back. That isn’t helpful. 1 year of getting used to the fact that everything in my life is different is not the same as bouncing back, because I had to find a new normal. I also do not want to undo all the hard work I have put into myself. I am worth the effort so here I am back with Mo trying to figure out what fitness level I am and how I am going to move and advance through new levels. So I made a few goals. I will engage with yoga stretches every morning for 5 mornings a week. Primarily focusing on my hamstrings. Walk for 30 minutes every day after work with my dog. 1 Long walk on the weekend for a minimum of 1 hour. focus on time not distance yet. planks every morning starting with as long as I can go, I suspect it will be 30 seconds but we will soon see. Record how long and increase over one month. 3 small goals is good for January. I will update my progress and reassess the goal in February. My long term goal is Canada Day 150 2.5km race. I plan to be in the creek a lot this month because its my happy place and I really need it. Health can sure change your life in a moments notice. I leave for Ireland in about 12 hours. I am about to embark on the most EPIC journey of my life…so far. It is no secret that I am a little nervous, so I am bringing with me my OWN team to keep me going. I am calling my team #TeamRR. The 3 of us are about to travel to new frontiers – well for us, and seek out new race courses and boldly go where Robyn has not gone before. Andie started out as a co-worker, morphed into my friend and somewhere along the way became my sister. We text daily and…well…she is important to me. She is also a HUGE reason why I get to go to Ireland. I wanted her to come with me, so she is. Remember those cartoons where there is a good guy and a bad guy on the shoulder of the main character? Yes, well… Andie is the mischief maker on this trip. She is the one who agrees with every thought I have and will get into major Shenanigans with me. We will be room mates for the entire trip. Warren is my wingman. He takes care of me when I don’t know how. He said today “You are going to miss me A LOT this week” True story. He makes me laugh every day and I would be lost without him. Warren will not be staying in the room with me…he is a dude. And although I like dudes, I am not that kind of girl who would expose him to the likes of Andie. He also will not be joining me at the pubs on this trip. Warren is the respectable one. And a heck of a runner, so he will be too fast for me and Andie, we will see him at the finish line each day – where he will cheer for us! WE are packed and ready to go. I have checked into Air Canada and have my seats ready, yay aisle seats! I fly to Toronto, then I will fly to Dublin. My bag is ready – a cute little carry on with room for buying stuff. I am so ready I think I might burst! 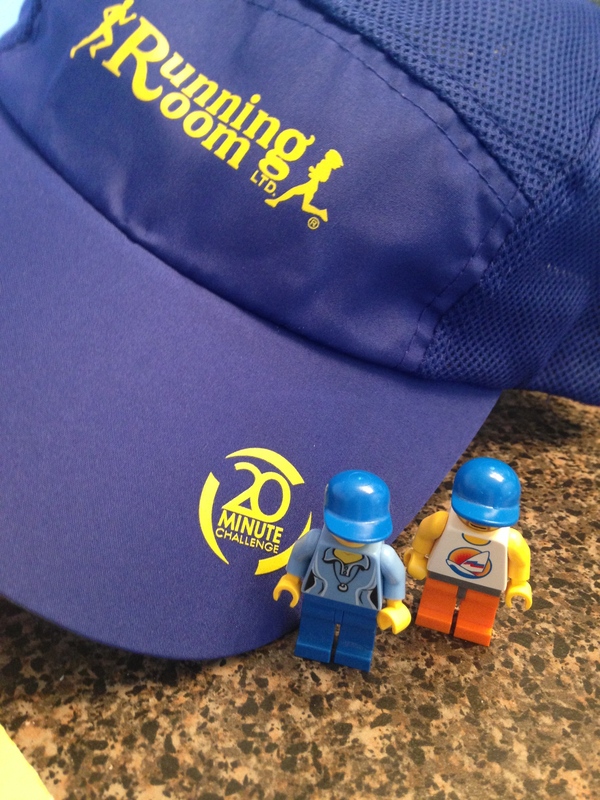 I am missing the 20 minute challenge at Run Club while I am gone so I have brought hats with me and took a photo with #TeamRR because we are still part of the big team even though we will be across the ocean. I won’t wear mine yet because it isn’t Wednesday. #teamRR and I have gone over the itinerary for tomorrow and feel as prepared as we are going to get. I am bringing my iPad with us, so I can blog on the road. There is a social media contest that I am eager to win – at the very least I want to place. Who are we kidding – go big or go home. I WANT TO WIN! So I need your help. Every time you see one of my #racetoKinvara hash tags on instagram, twitter or Facebook, please like/comment/share because I need the support of YOU to get me where I wish to be – On THE PODIUM! You are now officially part of #TeamRR I am asking for your help and support and It should be fun along the way! Now its time for rest because I have a very big day tomorrow. Today was my last run before I head to Ireland. The snake is bad. Edmonton is currently surrounded by forest fires and the smoke has settled over the city. For a gal who suffers from Asthma, this is not optimal training conditions. Also…its just stupid hot. For an Edmontonian temps that are in the 30C range just feel oppressive. Sleep doesn’t come to me. Breathing is difficult but I can’t blame the lack of sleep on conditions. I blame it on excitement! I googled the hotels, the first stop I am stay at Citywest and did some research on Dublin. The hotel is amazing and I get about 6 hours of tourist time. 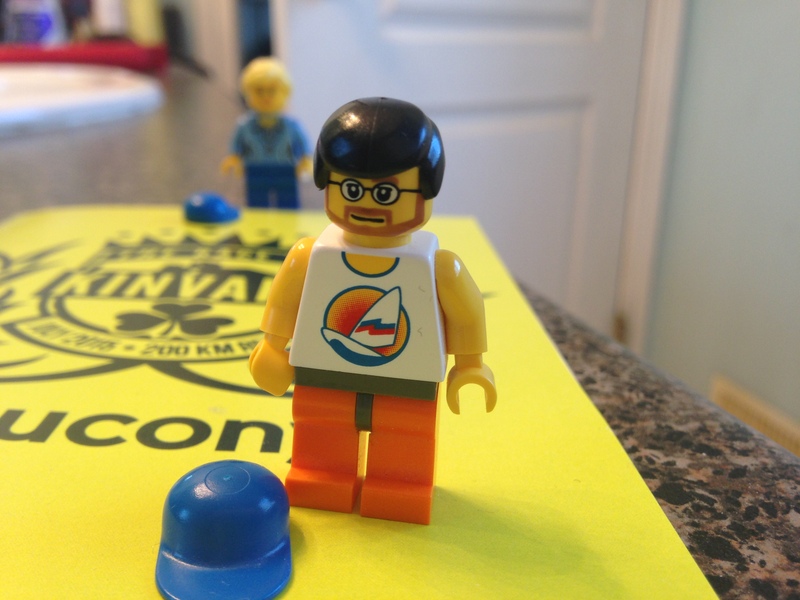 I am supposed to leave with my team Captain – who I suspect is my group leader from Saucony. 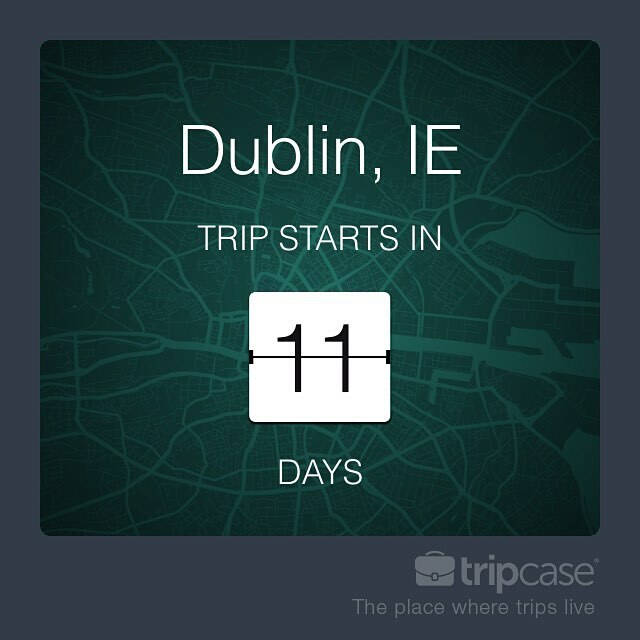 I hope we get to see Dublin Castle, St. Stephen’s Green and Trinity College. I am basing these tourist spots from my love of my favourite Authors books. Maeve Binchey paint a Dublin so dynamic I cannot wait to walk it! I am desperate for a Trinity College Hoodie. After our tour we head to the Guinness Storehouse. I likely will be ready for a pint by then. At some point I will meet with Team Canada to discuss strategy. It is at this point I will remind them I did not win because of my speed but for my charm and wit. I was able to take a peek at last years photos and saw the bus – not your average school bus, but a full on tour bus with snacks, tables and comfy seats. I visited Facebook.com/SauconyPro and took a look at the Race course. I’m telling you right now, it is not going to hurt my feelings being there! So whats left for today? I am going to pack. I dug out my passport. I have chosen my shoes. I have picked out my run gear. I have my chargers ready to roll because I hope to blog my adventure while there. I could use a nap, because I am not sleeping. Thankfully I will on the plane. Sleeping on planes is my super power. So the next time we chat, It will be from Ireland. I got a text while at work yesterday. YAY! My kit arrived! I only had 6 hours before I could go home a tear that box open! I knew it was coming. I had received an email with my airline tickets that my ‘kit’ would be arriving July 4th. 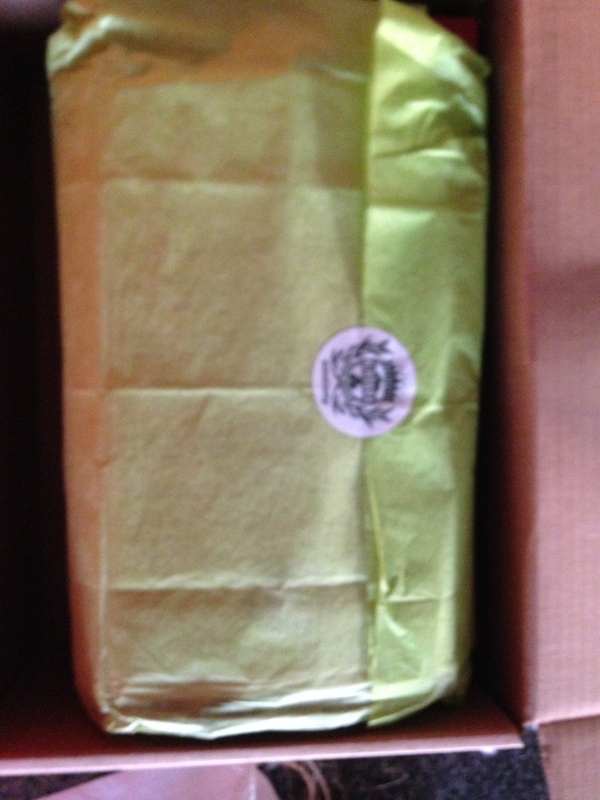 Well…it arrived July 3rd. It looked like this. I loved how it was wrapped in twine. Seriously, all packages need to be wrapped in twine! I savoured the moment. I want to say I didn’t know what to expect, but I work with shoes for a living. It felt like there were shoes in there and maybe some documents. I was that kid at Christmas who always touched the wrapped packages and could guess what was in there. Inside was the BOOK. This book outlines my trip. It let me know I have only 8 people on my team. Wowza…8 I know 3 for sure, maybe more. It also let me know I represent Team Canada, the other countries would include, Ireland, Belgium, Germany, USA…and some others I forgot. All I could think or register in my brain was 8. It also told me there were 22 legs one day and some another day…look, you do not expect me to remember do you? There is running involved and lots of it. But I was distracted by visiting the Guinness Storehouse the very first day! The next day I was distracted by Dinner at Kilkenny Castle! And the third day I was distracted by a SOCAIL MEDIA CONTEST! Now THAT is something I have a fighting chance to win! 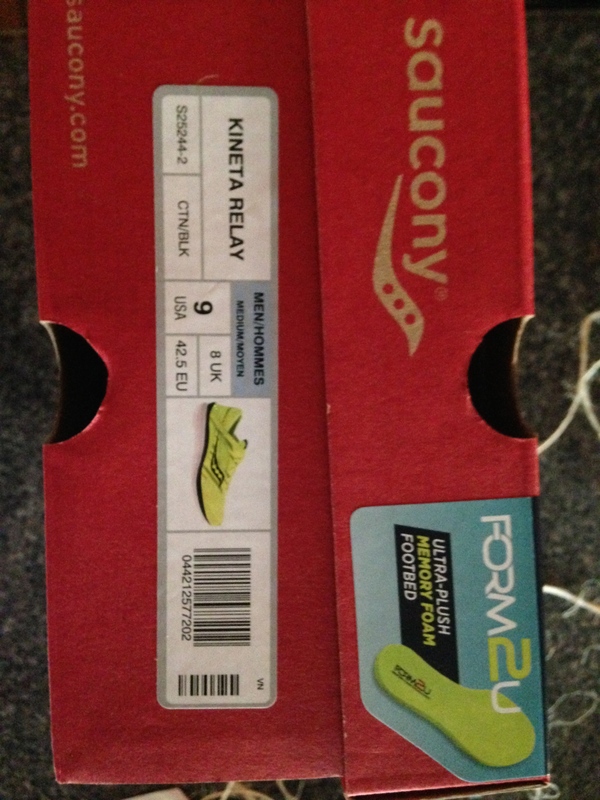 I need to tag everything #RacetoKinvara @Sacuony and for good measure #FindYourStrong. This blog series is about just that. I found my strong Saucony and its scary and wonderful all at once! 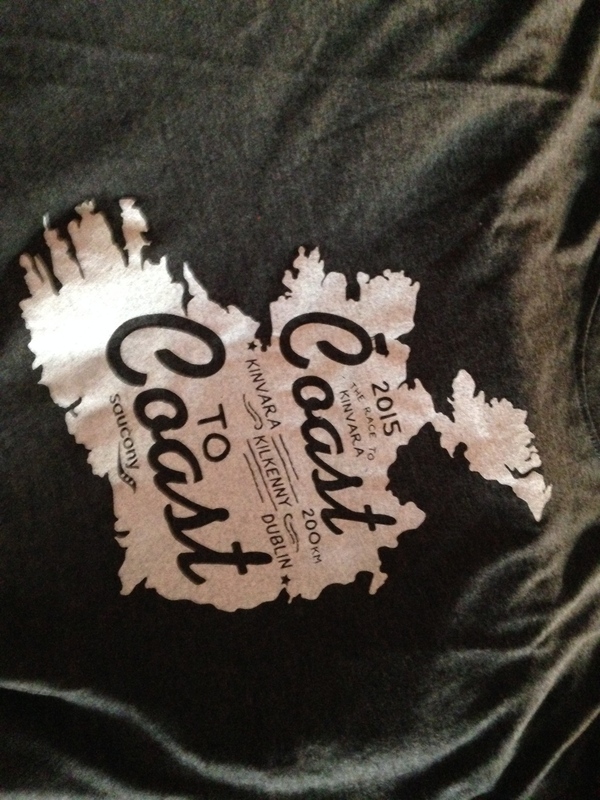 I read it…running…places I’ve not seen before, like the Atlantic Ocean from Ireland. Pinch me already. I put the book down, and read the letter from the President of Saucony – team spirit…fun… happy to be there… yep. sounds great! I am all for it! I put that letter down. I am a sucker for anything wrapped in tissue with a sticker. Its so…5th Avenue. 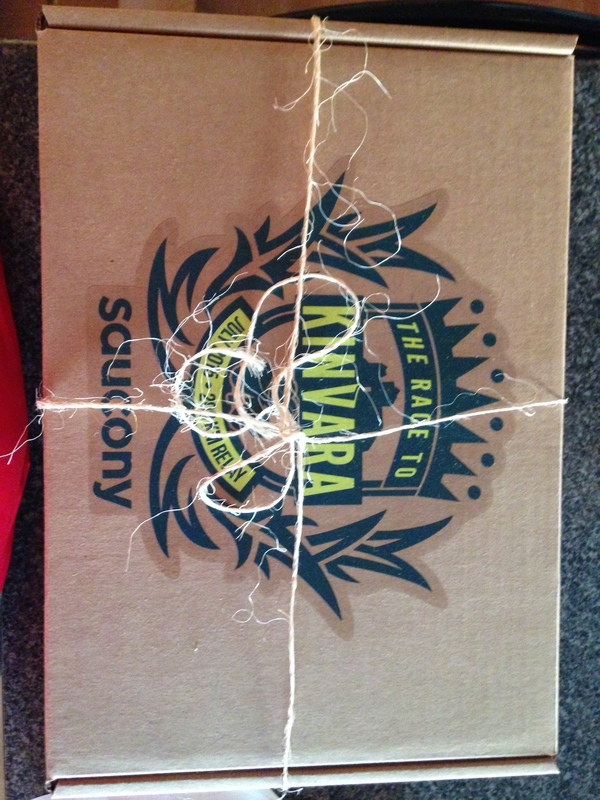 Ooooh Race to Kinvara Tees! A couple of weeks ago, Saucony Canada sent me a questionnaire to fill out regarding my size. 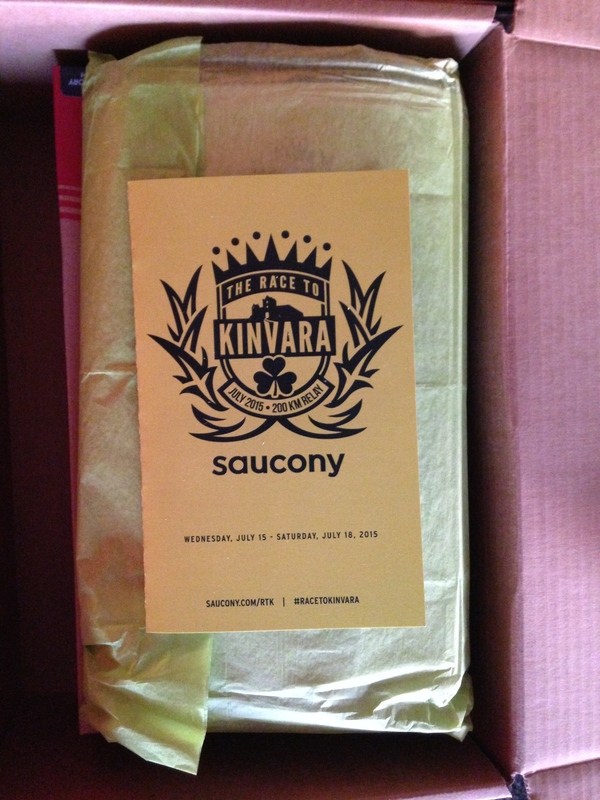 I replied with Shoes Women’s 10 or Men’s 9 – because I figured Kinvara 6 might be on the table….the women’s version is a little narrow for me. Men’s fit a bit better. It also asked clothing size. This is where I felt like not going. Just because I work in the industry and I am good at what I do, does not mean I am a Women’s medium. News Flash – while we are not the majority, we certainly are present. By we I mean fat girls. The industry does accommodate large men – okay men who are fat too. They do. Lots of things go up to men’s size 2XL. A men’s 2XL is really a XL, sizes are weird. But I would never dream of being able to fit into the women’s sizes yet. It just isn’t going to happen. So I am prepared to run in my running clothes that represent my place of work. The very reason I get to go in the first place. But I do know that I can fit into a men’s 2XL if it is stretchy – and by stretchy I mean, forgiving on the hips. Men tend to be not as curvy as women. so a bit of stretch helps a lot. In the green tissue were 2 T-Shirts. One size women’s L and one size Men’s L. And wow… I cried a bit because if they go this wrong, there isn’t a team Canada Jersey that I could dream of fitting into. It hurt a bit and took some of the excitement away. Why have me go through the humiliation of telling strangers my size if its wrong anyways? Anyways… I get to go to Ireland and this will not hurt my Irish experience. Stiff upper lip and all that. As I tell my staff when things get rough…ITs only Shoes and Clothes people. 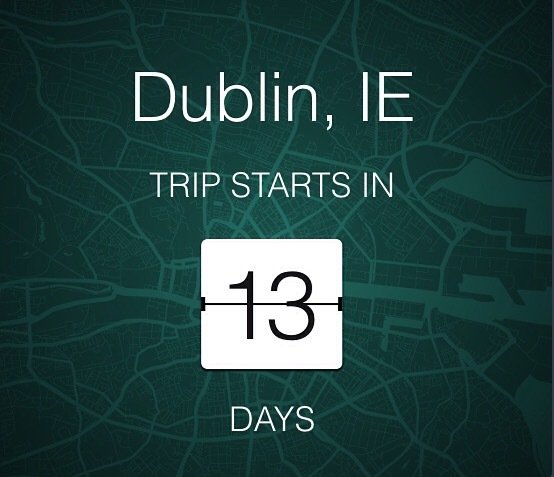 The world has bigger problems out there… I get to go Ireland!! I put those to the side and and looked at the next thing. Kineta Relay. Now I have heard about these but have never seen them. I quickly put them on because there is nothing that makes a fat girl happier than New Shoes and a Hand Bag. Why? Because they always fit. Always. These shoes weighed NOTHING. 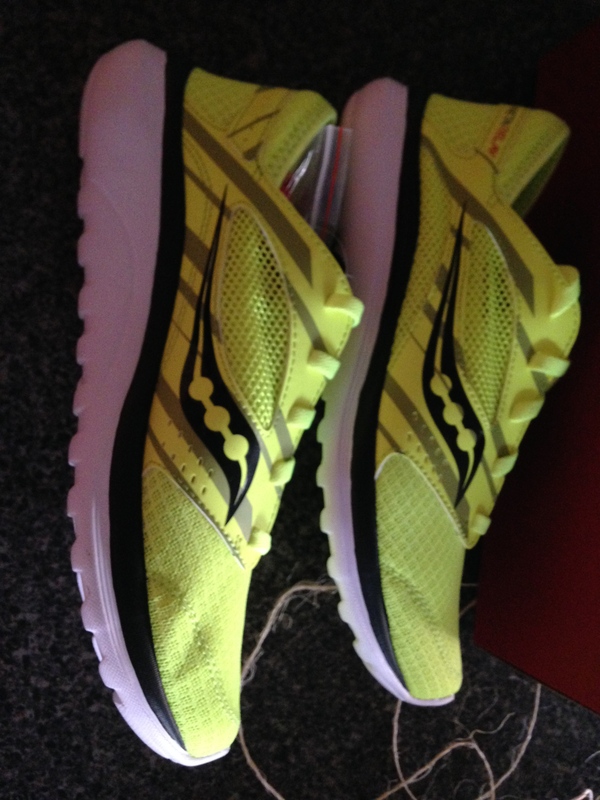 They were so light and so soft under foot, I decided to take them for a test run on Sunday…I cannot WAIT! They came with optional red laces, I might pop those on, I love red! I love these mostly because they are yellow. Not pink. VizGlo. Awesome! I was asked at work today how am I not jumping up and down all the time? Well I am inside. I am scared too and that keeps the jumps more subdued. I’m scared the jersey won’t fit, if I wasn’t scared before – I am now. If it doesn’t, I will be wearing red. My favourite RR T-shirt because you can’t expect me to wear what doesn’t fit. I’m trying my hardest. But I am just not there yet. 117lbs down and it still isn’t enough but I #FoundMyStong and that is enough for me. I took a little time off to distract myself from my exciting Race to Kinvara. I am getting to be like a little kid before they go to Disneyland….I CANT Stand IT! But I have a lot to do and sitting around day dreaming about Ireland is not getting things done. 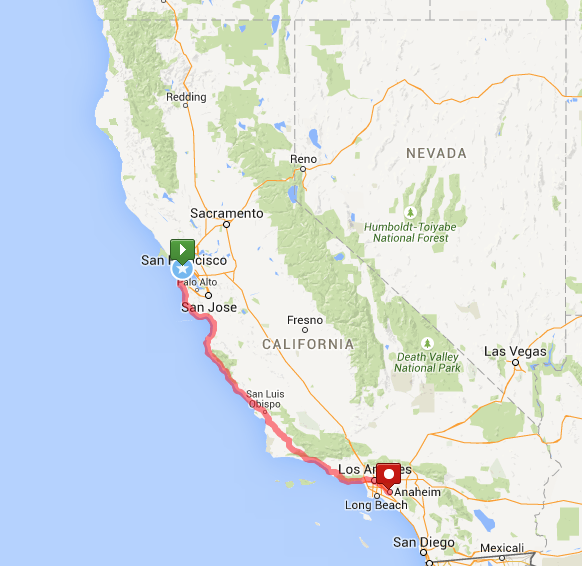 August, my pal Joe is going to run from San Francisco to Anaheim. About 28 miles or so a day. some days more, some days less. We are raising money and awareness for Spinal Muscular Atrophy. You can read all about how this all began here. all the details from taste to nutrition. Bland is his prefference for running. Bland tends not to keep resturants in business. The confevsation went like this… “I don’t like to eat too much before I run. Swell. You will need to supply your body with actual fuel. We talked about options. It is important that he gets carbs and lots of them of a multi day event like this. Oatmeal will be the mainstay of breakfast. And not that instant stuff. Old fashion steel cut oats – QuakerStyle. Secretly, this makes me happy – I love a great bowl of porridge! Apparently he likes apples, nuts and cinnamon. Perfect. I can control content, he gets 3 food groups for a meal, he is happy and I am happy. 4 food groups if we add dairy. That will be optional. Now… cooking it. When I was a kid, my parents took me around the world. They instilled a love of travel beyond the love of home and things. I would rather spend my money on going somewhere than on TVs, Cars and furniture. Traveling is expensive, especially with kids, but my mom economized and provided us with great food so we could walk in the footsteps of kings. You name it, my mom made it in that fry pan. We had eggs, soup, pasta, stirfry, and countless other meals from a single source. We had a camp kit – all the things you would need in a kitchen: can opener, knives, cutting board, colinder, wash basin, condinemnts, spices, oils etc. It fit in a plastic bin. The Frypan went in a suit case. 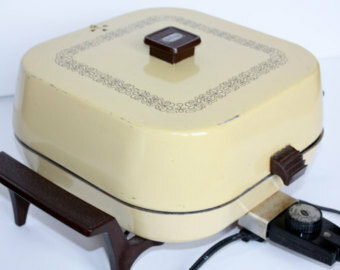 When we flew, the Frypan and a elecrical converter came with us. Between that and the hotel coffee pot, you can make anything. Ever have soup in a coffee pot? I have. She even warmed up bread by wrapping it in foil and placing it on top of the Fry Pan lid while dinner was cooking. The advantage to this was her picky eaters (Hello Mike I am looking at you) would still eat and she saved a TON of money so we could see and do things like wander around the Louvre in Paris, or Chill with the Pope at the Vatican or even wave to Paul Bunion as he talked to us from across the parking lot. Food is the one thing you cannot do without on vacation. Cooking and doing dishes is the least fun part about vacation – but it afforded us to do the fun things. Shopping in a grocery store in another country really is a cultural experience. It became part of the vacation. Trying foods that were new, or laughing at the unusal nature of flavour combinations – all new to us of course. became part of the experience. Food is the one thing that brings people together on the same level. So the menus for the days have come together with flexible options open for contingency plans. 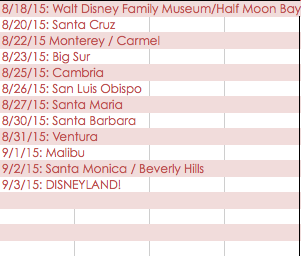 This trip is a million plans within a plan… and its all coming together.